Study: A team of scientists has successfully trained a new artificial intelligence (AI) algorithm to make accurate predictions regarding cognitive decline leading to Alzheimer's disease. The findings used data from the Alzheimer's Disease NeuroImaging Initiative. The researchers trained their algorithms using data from more than 800 people ranging from normal healthy seniors to those experiencing mild cognitive impairment, and Alzheimer's disease patients. They replicated their results within the study on an independently collected sample from the Australian Imaging and Biomarkers Lifestyle Study of Ageing. Worldwide, around 50 million people have dementia and the total number is projected to reach 82 million in 2030 and 152 million in 2050, according to the World Health Organization. Alzheimer's disease, the most common form of dementia, may contribute to 60-70% of cases. Presently, there is no truly effective treatment for this disease. 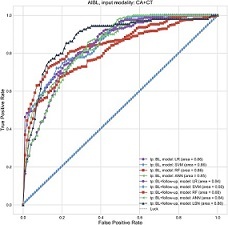 Illustration: MMSE prediction ROC curves for AIBL replication cohort. PLOS Computational Biology.